Let's make one thing clear: Roland Emmerich knows how to blow stuff up. This conceit, however, is what makes his latest end-of-days epic, 2012, all the more disappointing, as he uses his apt visceral emphasis to guise some woefully inept humanistic implications. And while critics (myself included) would likely razz the director had he gone the, in this case, more noble route of decided vacuousness, the deconstruction-via-destruction schema of his final product reads as overwhelmingly insolent. Of course, the idea of humans weighing their mortality in the face of pending doom is far from new. Bergman's reactionary commentary, The Seventh Seal, playfully dissects the social institutions and coping mechanisms that make life livable; his condemned-to-death protagonist runs the gamut from denial to acceptance with a subdued, reflexive grace. Contrastingly, there's Emmerich and his approach. A staunch proponent of Hollywood cliché, his work is characterized by human perseverance: his leads always escape peril (just barely! ), new societies emerge from smoldering rubble, and empathy for life lost is kept to a minimum as to alleviate otherwise depressive thoughts. This is all well and good (hey, we all like a good explosion, right? ), which is why I wish he had refrained from injecting issues like cultural priority, the weighing of lives, and even simulacra into 2012's otherwise "dumb fun" chassis. Still, many find the all-but extinction of mankind to be a curiously fascinating subject regardless of directorial tactlessness; as such, 2012 grossed a sizeable $166.1 million domestically on a peak of 3,444 screens. Taking into account its wondrous effects and stellar Blu-ray transfer, it will likely perform well on the home theater market to boot. With an opening shot that alludes to 2001: A Space Odyssey - which centrally frames aligning planets but posits fiery solar flares in the place of Kubrick's mysterial monolith - and a handful of other drive-by movie references ("We're going to need a bigger plane," anyone?) 2012 is obviously a picture concerned with its medium, though it doesn't celebrate cinema's sacred cows so much as it seeks to slaughter them. In fact, the running theme of the movie is the impossibility of placing ordinal value on intangibles, be it painting, literature, cinema, or even life. At the opening of the film we're told that the aforementioned solar flares are erupting with unprecedented size and frequency, causing neutrinos to pass into the Earth's core, thus warming it and destabilizing the crust above. In short, such an event, according to the film, will have our planet's plates playing Plinko with each other, leading to earthquakes, volcanic activity, and floods of unforeseen size. As such, this means the end of existence for all but a lucky few, which is why much ado is made over who and what gets to occupy space on a series of privately funded arks - the sole hope for survival. Alas, Emmerich uses this scenario to make some trite points about morality what with his character Adrian Helmsley (Chiwetel Ejiofor) lecturing various heads of state on our obligations as humans and all. Helmsley, a doctorate-bearing geologist, postulates that, by basing who is to live and who is to die solely on income (AKA those who made building the arks possible), we're marring the rebirth of our species by initially acting with cruelty. Naturally, Helmsely cares not about the practicalities of the situation - how the man-made vessels have finite amounts of food and oxygen, how a public informed of its demise would riot until their collective last breath, how our world is stratified by finance - and speaks of Utopian solutions simply in the name of what's "right." 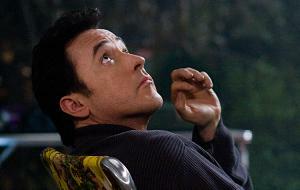 And with this message of equality in mind, I came to wonder why then does catastrophe, without prejudice, destroy everyone in its path but chase Jackson Curtis (John Cusack) and his family? By sparing them and celebrating their getaways, isn't Emmerich succumbing to the same tendency he's rallying against - placing an importance on one life over another? Of course he is, which is what makes 2012 such a throwaway of a throwaway. Faceless billions are killed in the name of fun while the potential loss of a Curtis-clan member is meant to evoke empathy. Sorry, I'm not buying it and neither should you. Putting aside my feelings for the film, the good people at Sony have done a phenomenal job in representing 2012 on the Blu-ray format. Even with its heavy dependence on all things digital, this dual-layered disc boasts a consistent light-yet-tight grain structure that seamlessly combines effects both special and practical. In this, detail abounds each frame and contrast levels exhibit some rather stunning examples of contraposed color. Blacks are rich, but allow for nuance and according allocations of depth. My only complaint, if I were to nitpick, would be that some dimly lit interior shots suffer from that overly-digital, matted look, though this is likely a fault of the Panavision Genesis (fitting, no?) HD cameras and not of Sony's BD treatment. In full, this high-def transfer makes Emmerich's vision of a world crumbling into itself a display-worthy example of immersive eye (and ear!) candy. Too bad it doesn't give the mind anything to chew on. Cast: John Cusack, Amanda Peet, Oliver Platt, Woody Harrelson, Danny Glover, Chiwetel Ejiofor and Thandie Newton. Rating: PG-13 for intense disaster sequences and some language.